461 Dean: the lights are on, but is anyone home? The lights are on, but is anyone home? The evidence isn't definitive, but there are a couple of clues that suggest that many if not all of those apartments are not occupied yet. First, as noted in the photo at right, shot from Flatbush Avenue near Dean Street, there are no shades or curtains in the apartments with lights on. If people were really living there, well, they'd look more lived-in. Similarly, there are no shades or curtains in the lower-floor windows shown in the photo directly below, shot from Dean Street near the arena loading dock. Nor are there in the upper floors. Oh, didn't BdB write "Cc'ing Rosen since he represents Barclay's Center"? 11/25 Post; 11/29 Post; 11/29 Post; 11/29 WSJ; 11/29 Daily News; 11/29 Post editorial. Some Chinese real-estate developers are lowering their profit expectations on U.S. projects or shelving them entirely as frothy prices and rocky partnerships force them to rethink their strategies in the American market. Swelling supply of high-end New York condominiums could result in losses for some Chinese developers, analysts said. A push to partner with U.S. developers on other projects, meanwhile, has brought unexpected legal spats and other delays. Meanwhile, the Chinese government is expected to limit the export of investment capital. In Brooklyn, a deal between Shanghai-based, state-owned conglomerate Greenland Holding Group and Forest City Realty Trust on a 22-acre, 15-building mixed-use project in various stages of construction is facing stiff headwinds. With no explanation as to why, Empire State Development, the state authority overseeing/shepherding Atlantic Yards/Pacific Park, yesterday rescheduled the Quality of Life Community Meeting from December 13 to Tuesday, January 24, 2017, six weeks later. The delay means that instead of a six week gap between meetings--the standard has typically been two months, or eight weeks--there will be a 12-week gap, or nearly three months. But the six-week gap was caused by bunching of previous meetings after delays. With many Brooklynites at risk of homelessness, Atlantic Yards can't help much to "solve Brooklyn's housing crisis"
"58% of all New Yorkers have inadequate savings to pay for expenses like food, housing, and rent in an emergency," declared the Association for Neighborhood & Housing Development (ANHD) in a recent report (chart at bottom), "How is Economic Opportunity Threatened in Your Neighborhood?" That led to headlines like DNAinfo's Most New Yorkers Are Roughly 1 Paycheck Away From Homelessness: Study and Gothamist's More Than Half Of New Yorkers Are One Paycheck Away From Homelessness, Says Study. The statistics are compiled by Community District/Community Board. Below are statistics for the four Community Boards in which residents get a preference for 50% of the units in each Atlantic Yards/Pacific Park housing lottery. Also see coverage regarding 535 Carlton and 461 Dean. Remember how the condo tower 550 Vanderbilt was described by developer Greenland Forest City Partners as "[n]estled at the intersection of five of the borough’s most desirable neighborhoods"? I focused on that bizarre geographic description, but project neighbor/opponent Patti Hagan pointed to the bizarreness of using the verb "nestle," which means, among other things, "to settle snugly or comfortably" and "lie in an inconspicuous or sheltered manner." Well, it's not inconspicuous at all, especially that extra height shown at right, still covered in scaffolding. Also see coverage regarding 535 Carlton and 550 Vanderbilt. 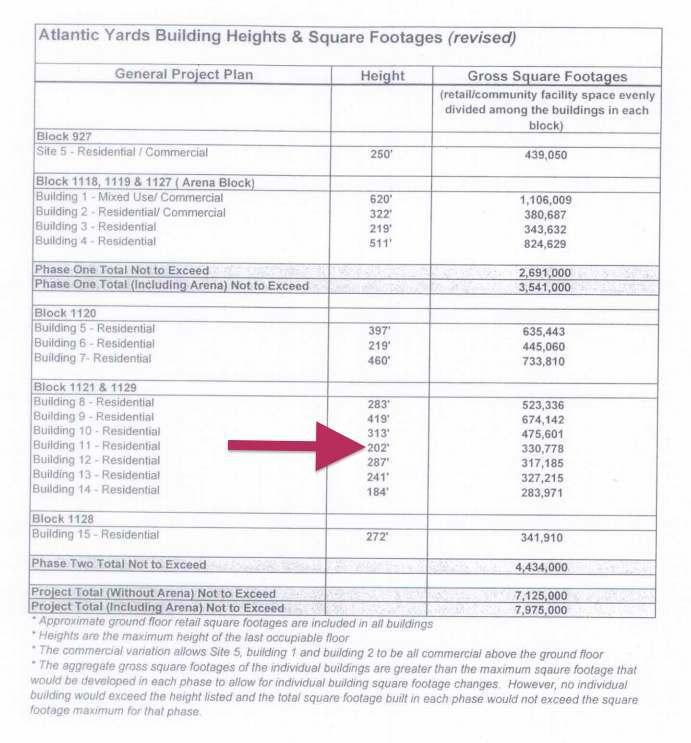 So, is 461 Dean Street (aka B2) really 322 feet tall, as stated in the developer's public presentation (excerpt at right), in Department of Buildings filings, and as listed in the Maximum Heights document prepared by Empire State Development, the state authority overseeing/shepherding the project? The height is defined--as is typical--as the "maximum height of the last occupiable floor." So the Council on Tall Buildings and Urban Habitat lists the building height as 359 feet, which is 37 feet taller than the official height. That's 11.5% taller. Indeed, the DOB says the last residential floor is Floor 32, while Floors 33 and 34 include a fire pump room and a generator room. Plus mechanical equipment on the roof. Also see coverage regarding 461 Dean and 550 Vanderbilt. 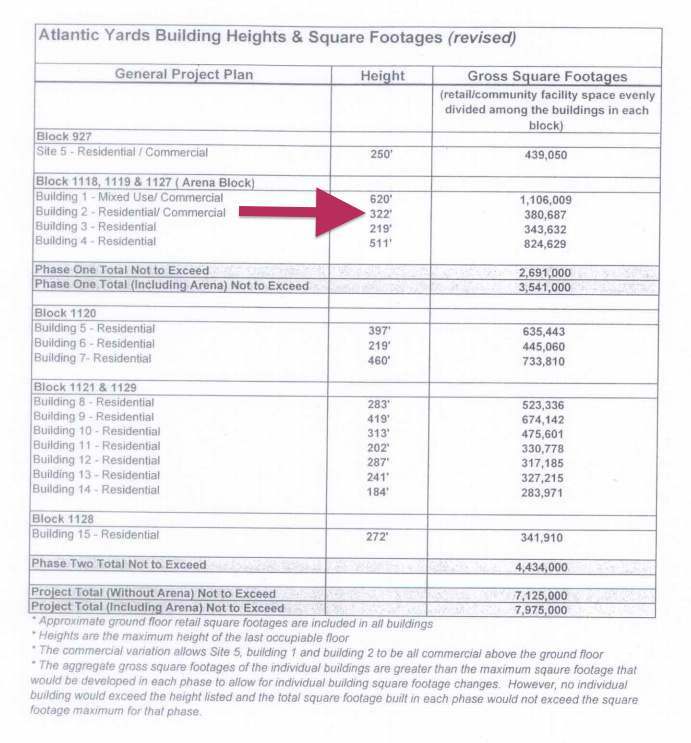 So, is 535 Carlton (aka B14) really 184 feet tall, as listed in the Maximum Heights document prepared by Empire State Development, the state authority overseeing/shepherding the project? The height is defined--as is typical--as the "maximum height of the last occupiable floor." That's 181 feet, according to this document filed with the Department of Buildings. But then add 37 feet for the bulkhead and mechanicals. That goes to 218 feet, or a little more than 20% more than permitted. See screenshots below, and clock to enlarge. And with the rooftop mechanicals, the 19-story building reaches 221 feet, according to the building permit on the Department of Buildings' web site. That's 20% taller. But unlike Cuomo’s relationship with Senate Republicans such as Dean Skelos (convicted last year on corruption charges) and John Flanagan, which he could at least justify under the guise of government functionality, the roots of his friendship with recently indicted Nassau County Executive Ed Mangano are far more complicated and perplexing. I've written about thisbefore, but the more I think about it, this testimony at the 9/18/06 community forum, part of the public input on the Atlantic Yards Draft Environmental Impact Statement, speaks both to the project's troubled history as well as the hope people invest in, well, real-estate executives known for extravagant promises. Wright, clean of drugs and alcohol for 16 years, spoke as if at a revival. Work--thanks to BUILD, one of the Atlantic Yards Community Benefits Agreement signatories--could make a huge difference. Well, this tweet sure caught my eye, as Mayor Bill de Blasio spoke 11/1/16 at Crain's 2016 NYC Summit. De Blasio now using Pacific Park (nee Atlantic Yards) as example of the correct way to build in New York City. — Dana Rubinstein (@danarubinstein) November 1, 2016 That was questionable Nov. 1, and it was even more questionable a few days later after the project's original developer, Forest City Ratner, confessed its investment was essentially worthless. There's a broader context for de Blasio's remarks, and that too deserves skepticism. Preparing for growth, but when do 9M people arrive? A pre-Thanksgiving document dump in response to a lawsuit from media outlets shows the consultant BerlinRosen and its co-leader Jonathan Rosen intimately involved with its client Mayor Bill de Blasio, which raises questions because the firm also represents firms doing business with the city, like Forest City Ratner, which then owned a majority share in the Barclays Center operating company. Notably, the documents (posted in full by NY1) show BerlinRosen and mayoral advisors, in January 2015, feverishly responding to my online op-ed in the New York Times arguing against having the 2016 Democratic National Convention in Brooklyn, drafting op-eds, letters, and tweets from supportive public officials and business people. Maryanne Gilmartin, whose company Forest City Ratner built Barclays Center in Downtown Brooklyn and is in the process of building several residential buildings in Pacific Park nearby, admitted that even in the best of circumstances, the process of completing infrastructure in NYC can be an onerous task. When Forest City Ratner was constructing the Barclays Center, part of the plan included renovating a subway entrance in front of the arena, which they had budgeted $12 million for. When it was finally finished, after two years, they had spent $73 million. FCR says "overall schedule is fixed," but when will project be done: 2025? 2032? 2035? Now that Atlantic Yards/Pacific Park faces unspecified delays, confessed earlier this month by Forest City Ratner's (FCR) parent Forest City Realty Trust (FCRT), when will the project get done? We don't know. "We remain committed to bringing the entire project to completion, but there are a number of existing and near-term market factors that we must consider,” MaryAnne Gilmartin, CEO of Forest City Ratner, said in an e-mailed statement. Those include the new development supply, rising labor costs and the resolution of issues surrounding a New York affordable housing program, she said. According to the latest Atlantic Yards/Pacific Park Construction Update (bottom), covering the two weeks beginning Nov. 21 and circulated yesterday at 12:55 pm (late) by Empire State Development after preparation by Greenland Forest City Partners (GFCP), there's no new work going on. That's because nothing in the document is marked with an asterisk or in red, which are used to indicate new work. Still, a comparison between the document and the previous Construction Update does show a few changes. Sewer work was described as "substantially completed, no upcoming work scheduled during this reporting period." Weekday and weekend work in the Vanderbilt Yard will not, during this period, require working hours to be extended to 7 pm. Today, apart from the Empire State or Chrysler Building, there are few icons of the skyline. The buildings outlined above, however, may someday be worthy of appearing in a Times Square souvenir snow globe. These are the projects that have captured the imagination of more than a dozen shapers and observers of the city consulted by The New York Times for their perspective on the new standouts. The home of the Nets and Islanders was built across the street from Robert Moses’ unrealized Dodgers stadium, though the arena was almost unrealized, too, after years of lawsuits over the use of eminent domain.